We recently purchased a beautiful new wood finish coffee table and were mortified to notice that there was a chip in it already. Thankfully, Guardsman® has a set of Wood Finish Touch-Up Markers that enabled us to cover up the area so that it blended nicely to match the original finished wood surface. It is almost impossible to notice the area that we covered up by using a blend of the medium and dark finish markers in the set (there is also a light marker included). These Wood Finish Touch-Up Markers are designed to “hide scratches, minor surface imperfections and worn edges.” I like that it is so easy to use and it dries quickly. 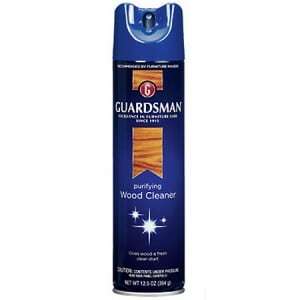 Guardsman® also has an excellent line of wood care products that I use on a regular basis for cleaning our furniture and cabinets including Purifying Wood Cleaner, Revitalizing Wood Furniture Polish, dusting and applicator cloths, Ring and Stain remover and Liquid Touch Up & Scratch Cover. One of my favorite “go to” products from Guardsman® is the Purifying Wood Cleaner because it consistently removes the dirt and grime build up that comes with having a family of three young children and a dog. It has a fantastic clean woodsy smell that really makes the house feel inviting and I can feel confident that my wood furniture, cabinets, pictures frames etc. are clean. 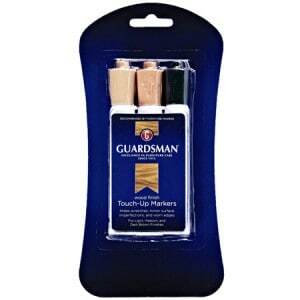 Guardsman® is a leader in furniture cleaning and they have proudly been in business since 1915. I feel confident that I am cleaning with the highest quality products available when my wood treasures are treated to Guardsman®. You can learn more about all of the fabulous cleaning products available by Guardsman® or purchase the items listed in this review by visiting their website.